For those after pet insects with relatively simple needs, grasshoppers (suborder Caelifera) might be a convenient choice. They usually eat readily available vegetation, don’t require special equipment or a huge tank and are unlikely to scare visitors. Because of the vast number of different species -- about 11,000 at the last count -- you’ll need to investigate the specific needs of your pets, but basic care doesn’t vary much. The basic housing for a grasshopper consists of a 5- to 10-gallon old fish tank with a mesh top. Add a couple of inches of a safe substrate, such as chemical-free potting compost, suitable food and some twigs for climbing. Some exotic grasshoppers require additional warmth from a reptile heat mat and/or a humid tank. Increase the humidity as required by moistening the substrate and misting the tank with dechlorinated, distilled or bottled water, which is also what should go in the water bowl. Most species can be kept in groups, although it is advisable to separate the sexes, partly to prevent an excess of grasshoppers, and partly because they sometimes die shortly after breeding. Most species of grasshoppers are 100 percent herbivorous and not especially choosy about their diet. 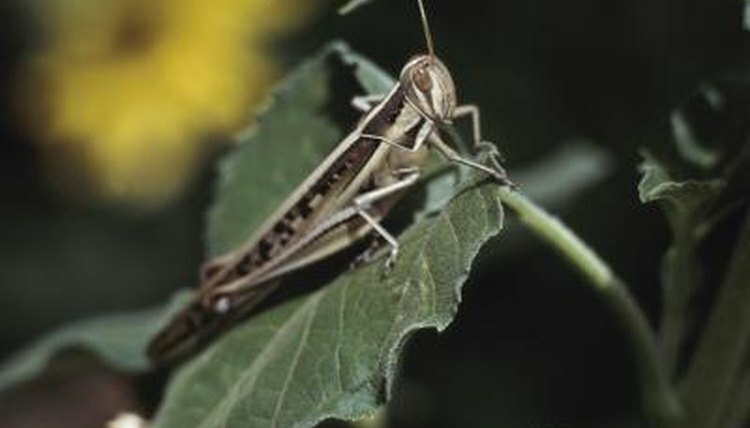 A mixture of local vegetation, such as hand-cut grass clippings, along with slices of fresh fruit and vegetables provide an adequate diet for your average grasshopper. Be aware, however, that some species might have more specific requirements, so check first. If the grasshoppers came from a pet store -- where they are often sold as food for reptiles -- the staff can advise you on diet and care. Rinse all leaves and vegetables thoroughly unless you are certain they are organic, as insecticides are, of course, lethal to insects. Change the water daily and remove any pieces of uneaten food before they go moldy -- grasshoppers are vulnerable to fungal infections. Clean the tank completely once or twice a month, more often if you have a large number of grasshoppers. To clean, transfer the grasshoppers to a holding container, such as a plastic box with air holes and a bit of hay, dispose of the substrate, rinse out the tank and dry it with paper towels before adding fresh substrate and food and replacing the grasshoppers. Don’t use household cleaning chemicals, most of which are lethal to insects. If you do need a cleaning substance, use a vinegar spray or dishwashing liquid and rinse thoroughly afterward. Taking grasshoppers from the wild and releasing them outside can both cause problems. Some species are endangered, so capturing a couple of individuals to keep as pets only makes this worse. Others are agricultural pests, while if you release a non-native creature anywhere, it could become established as an invasive species and cause problems for local ecosystems. You have two options: a common local species caught outside and perhaps released later, or captive-bred grasshoppers from an exotic pet supplier, which should not be released. If you are a hobbyist wanting an unusual species, ensure you only buy captive-bred individuals. Are Mealworms Harmful After They Change into Beetles? Can Hamsters Have Spinach Leaves?